The elephant orphanage in Pinnawala which is located northeast of Colombo and will take a bus or train ride to get there is a great opportunity to get up close and personal with the elephants. You can even help their trainers bath them and take pictures of the little elephants with their mothers. The downside would be the many tourists who will probably share your passion for these beautiful animals but I myself was so absorbed by the moment that I didn't really bother me. 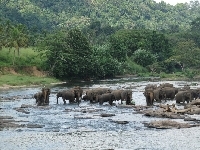 You can visit Pinnawala on a day trip from Colombo if you get up early, it's located at about 90 km, but I would suggest stopping here while travelling from one place to another since Pinnawala is a small town and besides the elephant orphanage there is not much to see. Did you enjoy Trip to Pinnawala Sri Lanka and have you been on a holiday in Pinnawala, Sri Lanka?